Alzheimer’s disease (AD) and Parkinson’s disease (PD) are the most common age-related degenerative disorders of the human brain. Both diseases involve multiple neuronal systems and are the consequences of cytoskeletal abnormalities. In AD susceptible neurons produce neurofibrillary changes, while in Parkinson’s disease, they develop Lewy bodies. In AD six developmental stages can be distinguished on account of the predictable manner in which the neurofibrillary changes spread across the cerebral cortex. During the course of PD numerous limbic determined parts of the brain undergo specific lesions regulating endocrine and autonomic functions. In general, the extranigral destructions are in themselves not sufficient to produce overt intellectual deterioration. 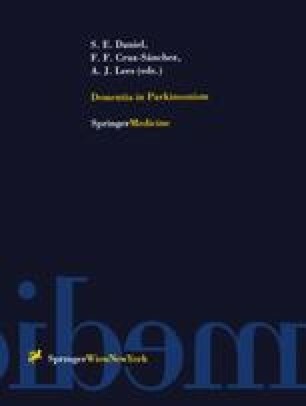 Fully developed Parkinson’s disease with concurring incipient Alzheime’s disease is likely to cause impaired cognition.